A team of four ASU students is headed to Seattle, April 20, to compete in the Microsoft Imagine Cup U.S. finals, which is a step away from the Imagine Cup Worldwide finals – the premier international student technology competition. The FlashFood team will be among 10 teams competing in the Design Software category. Another 12 teams are finalists in the Game Design category. Hundreds of teams from throughout the United States vied for a place in the Imagine Cup finals. FlashFood is developing technology and systems to help prevent food waste and deliver fresh food to people in need. Team members are: Eric Lehnhardt, a senior biomedical engineering major; Katelyn Keberle, a senior materials science and engineering major; Steven Hernandez, a senior computer science major; and senior marketing and sustainability major Jake Irvin. 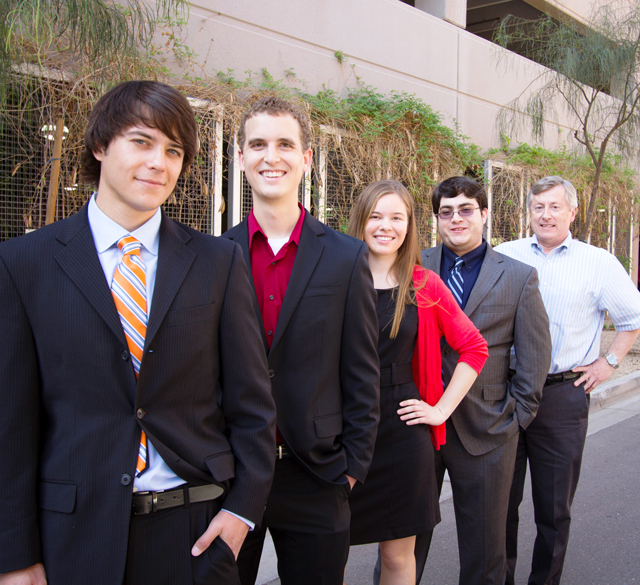 Their venture evolved from projects developed in the Engineering Projects in Community Service (EPICS) program in ASU’s Ira A. Fulton Schools of Engineering and the Students in Free Enterprise (SIFE) program in ASU’s W. P. Carey School of Business. EPICS director Richard Filley is Flashfood’s faculty advisor. The team is forming a network of restaurants and banquet halls to donate leftover and surplus food to Flashfood operations, which would then take it to drop-off points at or near local community centers, churches and schools for distribution to families and individuals. The students are working on a mobile-phone application to help manage their food pickup and distribution system. The app would be used for communications between the providers, collectors and recipients of the food. The Flashfood project’s goal is to operate every day of the week, particularly on evenings when conventions, parties and other events may have available food that would otherwise be thrown away, Lehnhardt says. Flashfood’s leaders are also organizing a training program for other student volunteers to participate in the service. The Imagine Cup competition challenges students to use technology to develop innovative solutions to some of the world’s biggest problems. The competition began in 2003 with about 1,000 students working with various teams. Last year more than 358,000 students from 183 countries and regions around the world participated as part of teams trying to move through the stages of the competition. At the U.S. finals, the top four teams in each of the two categories will win prize packages that include funding to support their ventures. First-place winners in each division will move on to the Imagine Cup Worldwide finals in Sydney, Australia in July, plus receive additional funding for their projects. “It’s gratifying that an issue that is important to us, and a solution we think will make such a difference, is important enough to others that they would be willing to give us this opportunity,” Lehnhardt says. Competing in the Imagine Cup U.S. final will give Flashfood members motivation to more thoroughly develop their plan and articulate their goals, he says, and will help publicize the project to the local communities in which they hope to establish their system. The Imagine Cup limits teams entering the competition to four members. Three other ASU students among the founding members of FlashFood are Loni Amundson, a senior sustainability major, Ramya Baratam, a senior computer science major. Mary Hannah Smith, a global studies and sustainability major. For more about the Microsoft Imagine Cup U.S. final, visit http://www.imaginecup.us/#fbid=xPyq7DvK0IH.